Organic baby gifts are popular as they provide an ecologically friendly alternative to mass produced products. Ideal for babies with allergies or sensitive skin, each design here features soft and pure fabrics responsibly sourced and completely organic. Eco-conscious parents are certain to acknowledge the uniqueness and purity of these beautiful creations. 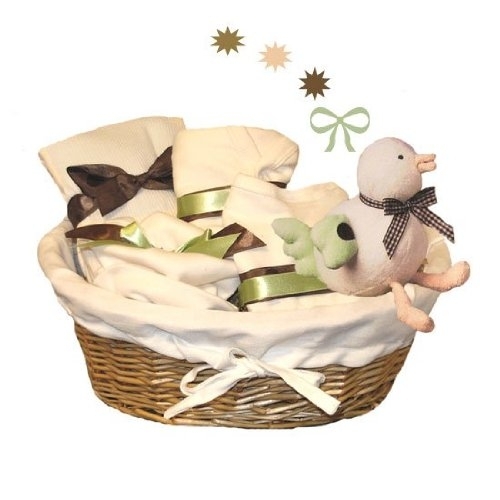 Each of these baskets or diaper cakes contains only the best in organics and assures a natural beginning to the infant essentials used to swaddle and enrobe the new baby. For questions, please use our contact page to reach us or give us a call at 866-476-0213. All these designs are completely guaranteed and include free shipping.